Home news smartphone Technology Galaxy Note 8: Its Best Feature Soon On A Galaxy C? Galaxy Note 8: Its Best Feature Soon On A Galaxy C? Everything suggests that the upcoming Galaxy Note 8 will appear with a dual rear camera. Nevertheless, according to a new report, we may not have to wait too long for a Samsung laptop to have this feature. Many hoped that such a camera would appear with the Galaxy S8 flagship model and, although it did not happen, it seems that Samsung may have tried to integrate it, eventually changing its design design. Probably the same was true for a stabilized frontal lens. 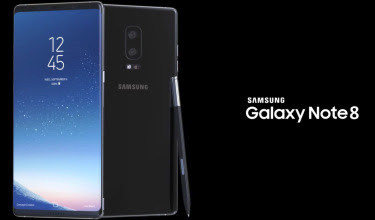 A famous source of leaks of this type revealed on Twitter, in a recent tweet, that "the first Samsung smartphone with dual camera will not be the Galaxy Note 8. " As a result, to bring clarification, another tweet introducing A sketch drawn by hand was posted to reveal that it is a new "Galaxy C" that will be the beneficiary of the new camera. This same author of tweets has followed others, punctuated by the emoji "laughing with tears": tweets of models that envisage the possible configurations of the camera of the "Galaxy C". Of course, a sketch made by hand would not usually be considered very convincing, and I take this information with more caution than usual. But in light of many other information leaks putting on the track of the dual camera Samsung, the news seems highly plausible. It should also be mentioned that Samsung would be rather behind the market, as for this technology. While the Galaxy S have been widely acclaimed for their excellent camera - which lessens the need for a second optical module for simple photo quality - there are some things you can not do with the single lens camera Of a smartphone. On the other hand, testing a camera so radically new with Samsung's most important smartphone, the Galaxy S8 , could have been perceived as a bit too risky at a time when the company could not afford The slightest error after the debacle of the Galaxy Note 7 battery. Launching the feature with another model would be a safer way to test it and eliminate any potential flaws before engaging it in the flagship model of the 'business. At the end of the day, whether or not we hear about a Galaxy C before launching the Galaxy Note 8, it seems obvious that the dual camera is finally a feature built into the Samsung project.